The Rails Swim/Dive team held the first annual Back-To-The-Board Varsity Dive Invite on Monday, August 22. The dive invite included 14 divers from five schools – Ames, Boone, Dowling, Johnston and Lincoln. The Rails did great! Junior, Jolynn Harris narrowly edged out Jayna Misra, an Ames sophomore, for the overall victory with a final score of 470.40 vs. 468.45! Annie Noll took third with a 373.75. “It was exciting to win my first meet this season. I’m aiming for a state championship in diving and meets like to tonight help me get closer to my goal. 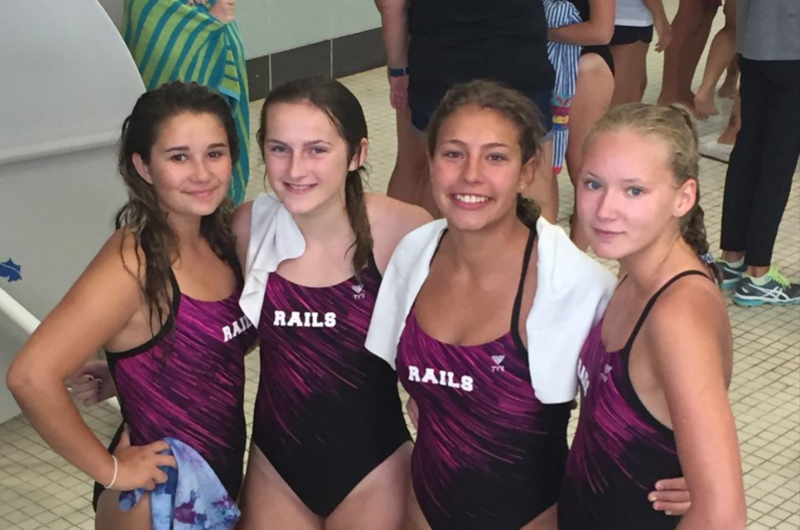 Plus – my teammates did well too, so it was a great night for Rails Diving!” said Jolynn Harris. The Rails decided to offer this invite because it fills a void for divers looking to have an early 11 dive meet. Our Back-To-The-Board invite allows coaches and divers to look ahead to mid-late September, when invites are more common, and set real goals for those competitions. The chance to dive early and set a benchmark is great for our divers and we hope to see it pay off come the end of season. Haley Allen dove a 249.85. That’s about 15 points better than her previous best! Kristina Toben six dives worth at least 30 points, which will be a big help reaching her season goals. Chloe Pearson dove her first official 11 dive meet! Her score of 339.65 puts two points above last years cut score. Jolynn Harris dove her second best score with 9 of 11 dives having a score of 40 points or higher! Here’s just a few shots from the meet. When the divers compete at dual meets, then our parent photographers snap some live-action shots too. Be sure to check out the photo website to see them all. Biting the medals, it’s an Olympic year after all! Rails vs. SE Polk | Sept. 6 at 5:30PM: The Rails have their first home meet and face the Rams in what will be an exciting meet! Diving is going to play a key role in the final team score of the evening, so it’s going to be a great meet to watch. Diving takes place after the 50 Freestyle, usually around 5:45PM.